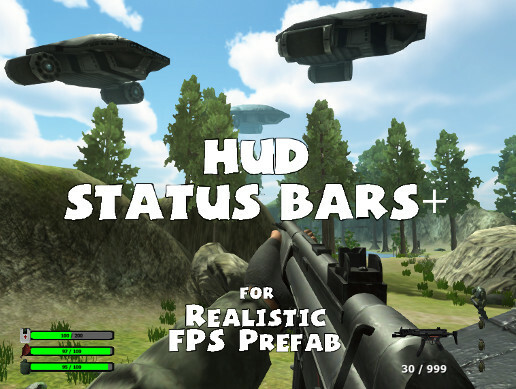 HUD Status Bars+ adds graphical status bars and a graphical weapon HUD for Azuline Studios' Realistic RFPS Prefab. It include three status bars: Health, Hunger and Thirst. It also includes a graphical weapon display to show graphics for all weapons that are included with RFPS. It shows ammo amount, and grenades if you're carrying any. HUD Status Bars+ easily integrates into Realistic FPS Prefab using a built in unity wizard. Just drag the player and status bar objects in, and you are ready to go with a HUD display for your latest game.